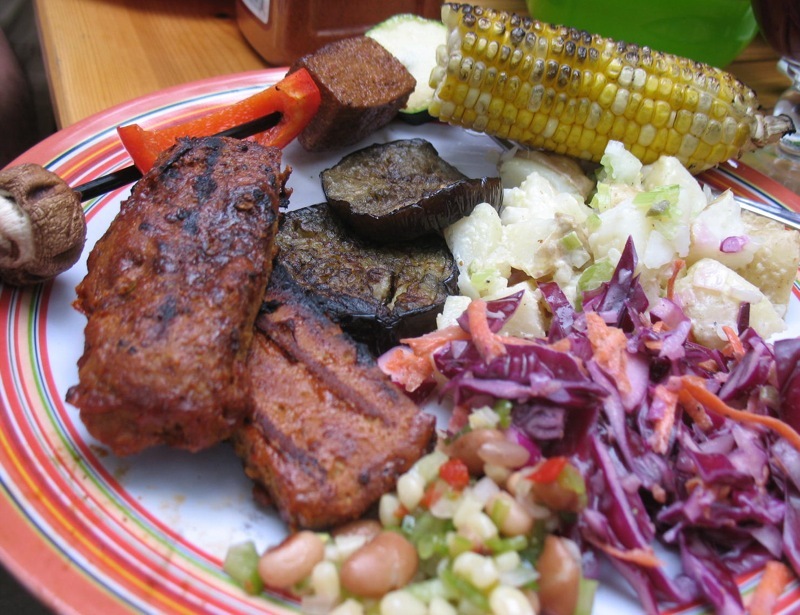 This past weekend, we got invited to a cookout at Bridget's house- my very first vegan barbeque! Spending time with Bridget and Trac and their husbands (and their dogs!) seemed like an awesome way to kick off the (unofficial) start of the summer. And I'm here to tell you that we ate some of the best food ever! 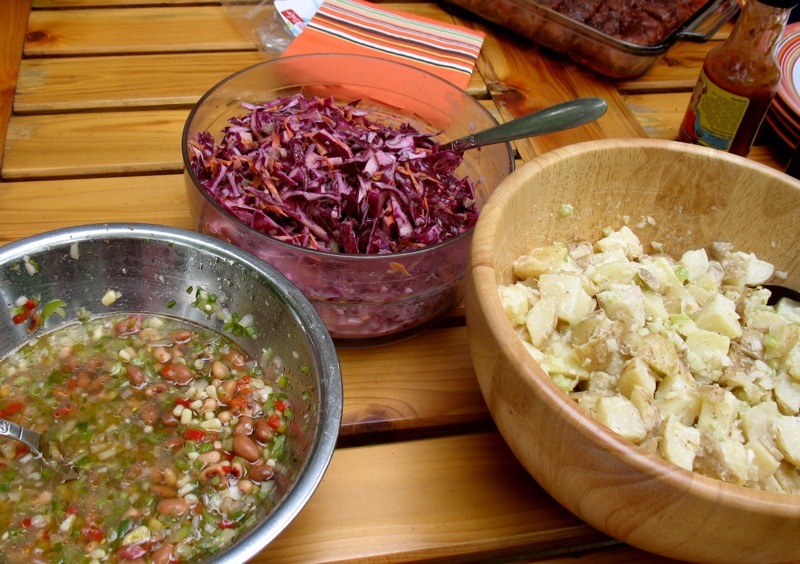 Texas Caviar, cole slaw, and potato salad. I had promised to bring the cole slaw and the potato salad, and I was so happy to be able to go to the farmer's market that morning and find everything I needed! The farmer's market was really crowded and hopping. Memorial Day weekend is the traditional planting weekend here in Syracuse, so everyone was scrambling to buy garden vegetables and flowers to plant. I was shocked when I first realized how late the gardening season starts here, but the risk of frost lingers until the end of May. 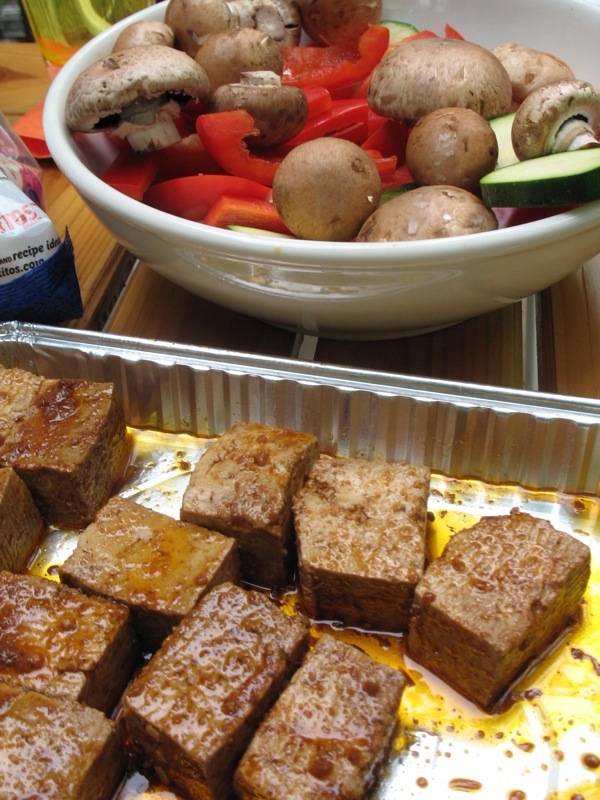 Marinated tofu and veggies, getting ready for everyone to make them into individual kabobs. The tofu was extremely spicy and delicious (look on Bridget's blog for the marinade recipe), and making our own kabobs was loads of fun. I went for a bit of everything- zucchini, red peppers, and mushrooms. Yum. 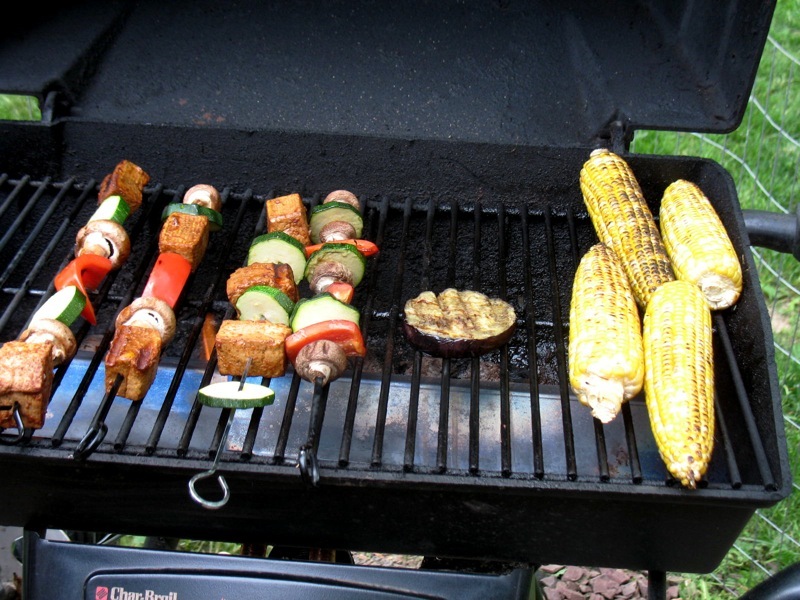 Some corn, eggplant, and kabobs, grilling away. It took us a while to get the hang of grilling the corn and the eggplants, but they came out fantastic in the end. The eggplant was so tender and sweet, I'm still dreaming about it. Here's my plate. In a Bazu historical first, this was too much food, even for me- that is saying a lot! Everything was so delicious... not to mention the sangria that Bridget had made. Is it just me or does sangria make everything taste better? And yet, magically, I managed to make room for dessert. 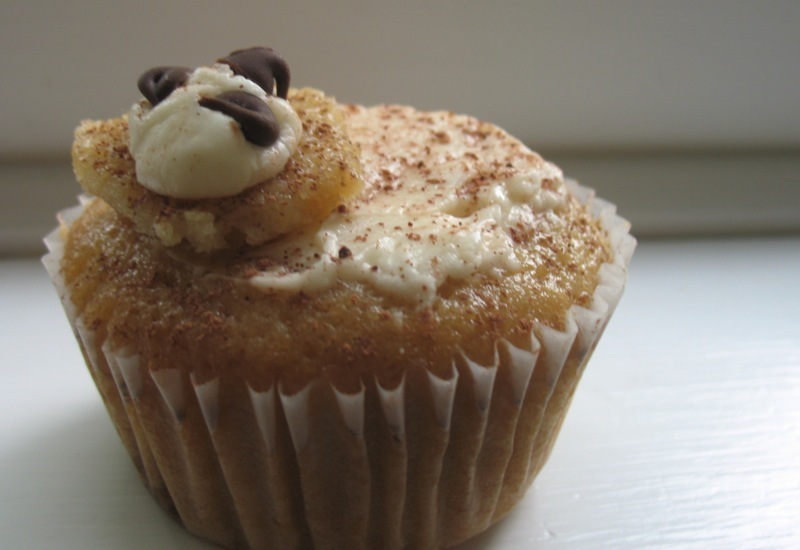 Here are the tiramisu cupcakes that Trac had baked. Oh my word, these were magnificent. Just picture the best cupcake you can, soaked in espresso and liqueur, topped with a decadent cream cheese frosting, and chocolate chips, and cocoa powder... let's just say we were all in heaven. Bridget generously sent us home with tons of food (we lived on delicious leftovers for the rest of the weekend!) and she even gave us a gift! 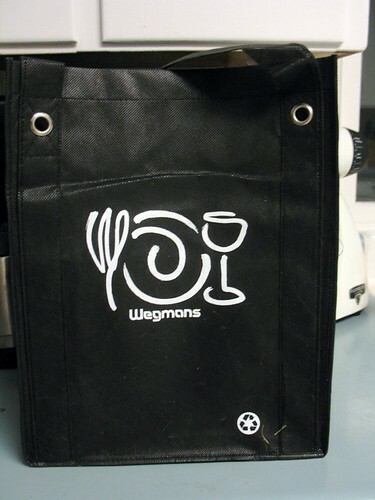 These are reusable grocery bags that I had been wanting, since Daiku and I have gone on a 100% plastic bag diet. I was so touched by Bill and Bridget's hospitality and generosity. Thank you guys so much for our first vegan BBQ! It has set the bar high. 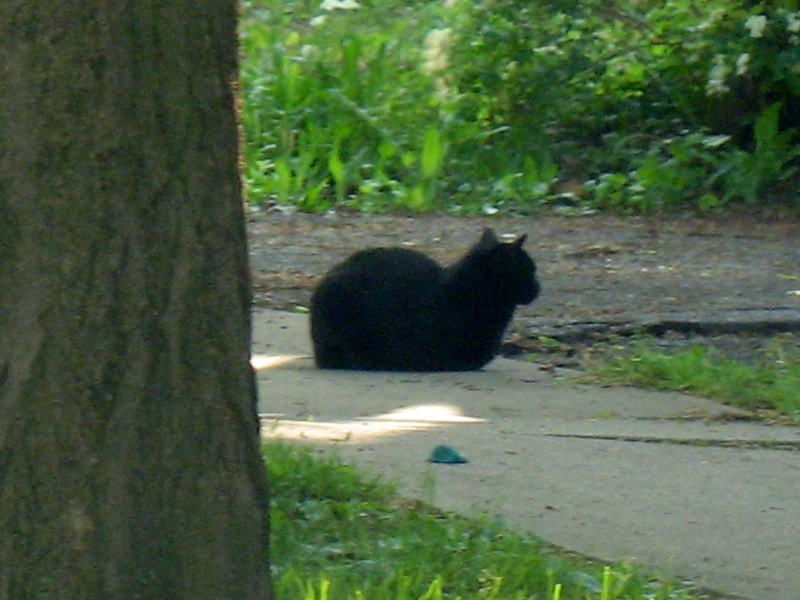 A neighborhood kitty, chilling in the shade. 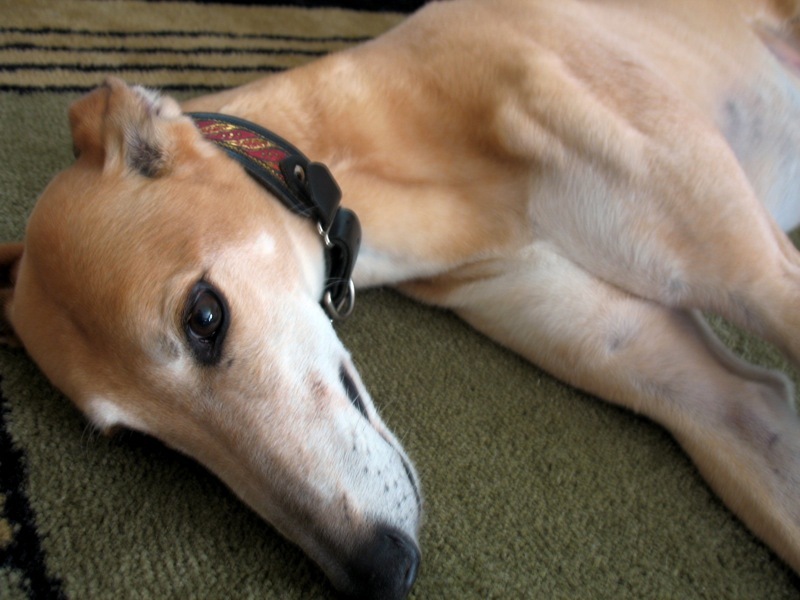 I thought she almost looked like a snail- isn't this adorable? Here's one of the tomato plants we picked up from the farmer's market. It is a green zebra heirloom variety. We are going to be away for much of this summer, so we had to scale back our garden. 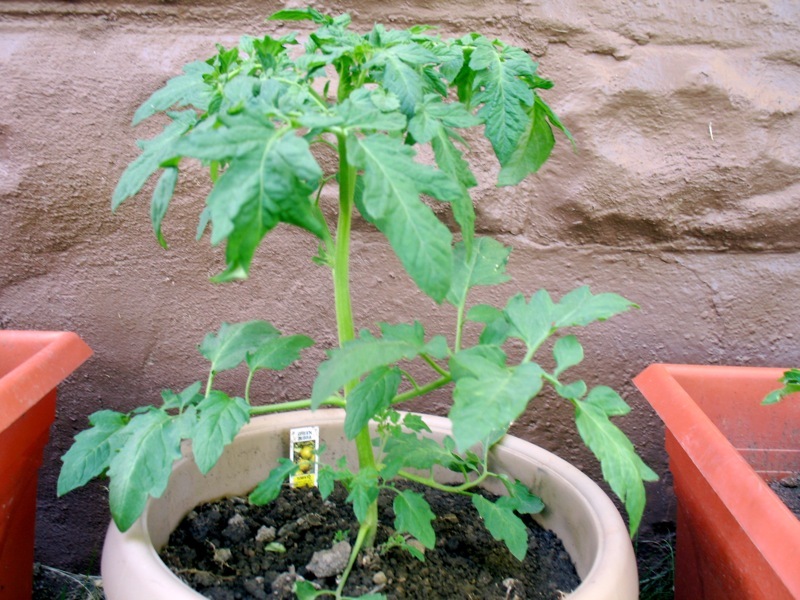 We have planted a few things into the ground (cucumbers, peppers, tomatoes) and a few into containers (like this and a few other tomatoes). Last summer, the growing season proved to be too short for the large heirloom tomatoes. We'll see how this summer goes. I want to wish everyone a happy, fun-, and food-filled start to the summer! I hope you all get the most of your long weekends, and I can't wait to catch up with everyone next week. 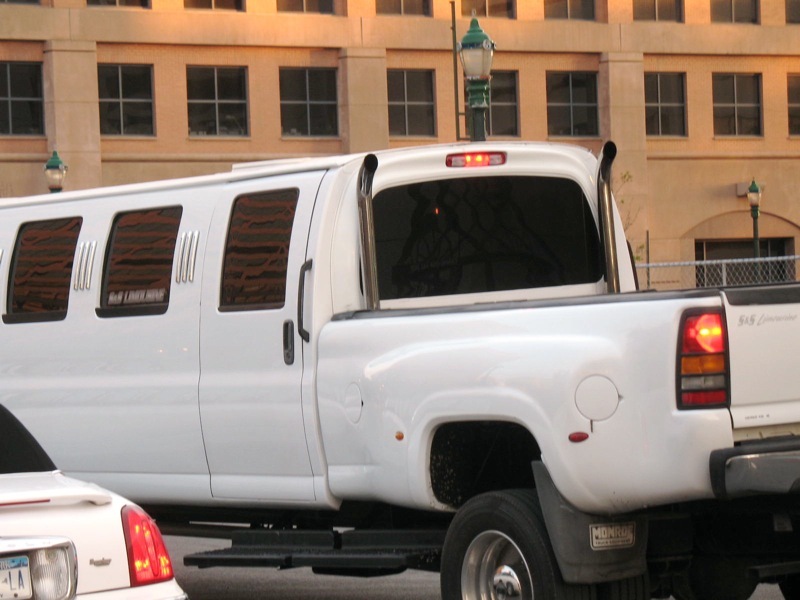 A lovely, only-in-America, I don't give a crap about the environment model pick-up truck/stretch limo... sigh. 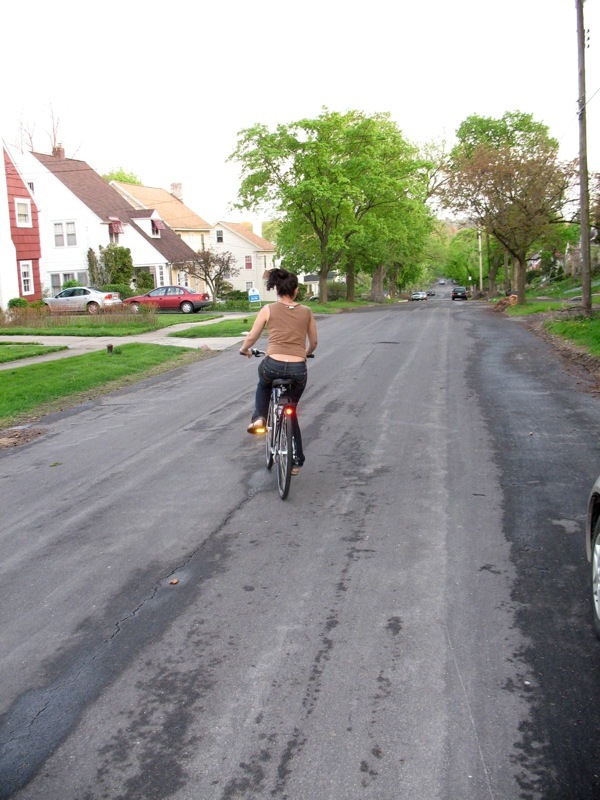 The weather is finally hot here in Syracuse. Not pleasantly warm or spring-like, but HOT. And I like nothing more on a hot, humid, tropical day than some fine Southeast Asian food. 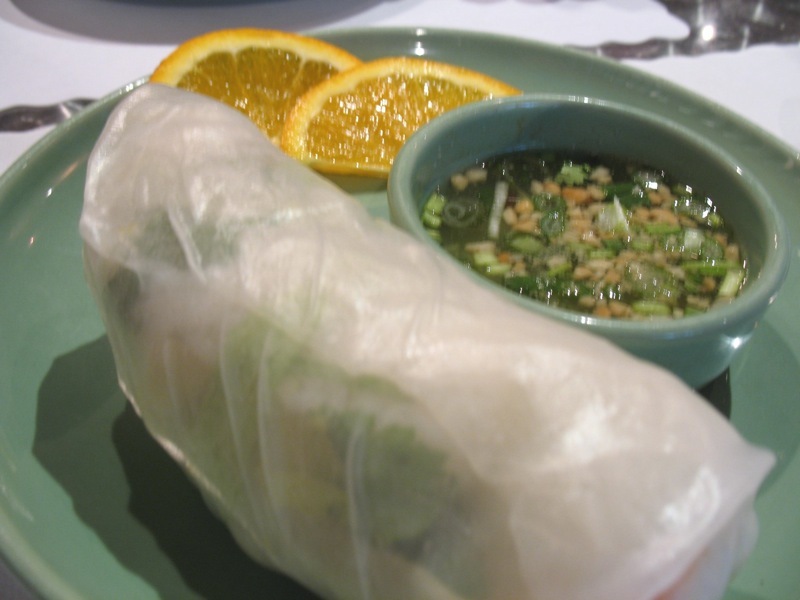 Vietnamese, Thai, and Laotian cuisines all share in common a masterful blending of fragrant and complementary ingredients that add up to a sum greater than their parts. One sniff of Thai basil or fresh mint is enough to transport me to some of my favorite meals and memories. When we lived in New York City, Daiku and I enjoyed walking down to Chinatown on the hottest of days and stepping in to random small restaurants and enjoying some cooling, refreshing food and drinks. 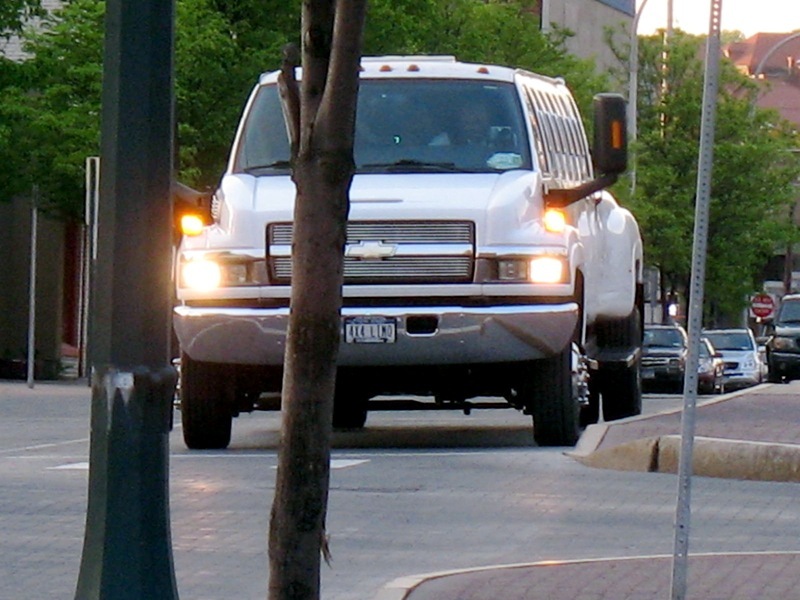 Fortunately, we can do that in Syracuse too. There are a few Thai and Vietnamese restaurants, but our favorite is Lao Village, a small and friendly restaurant specializing in Laotian and Thai cuisines. (Click here to see their menu). 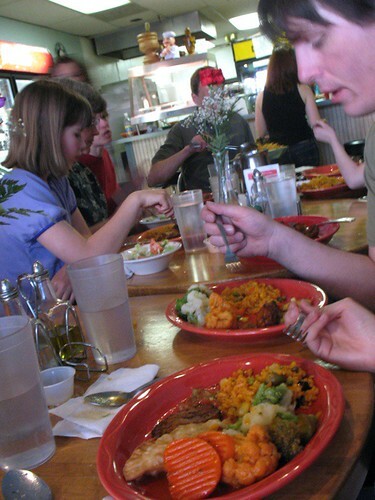 They feature a large selection of vegetarian dishes, and their daily specials always feature at least a few vegetable, tofu, and seitan options. 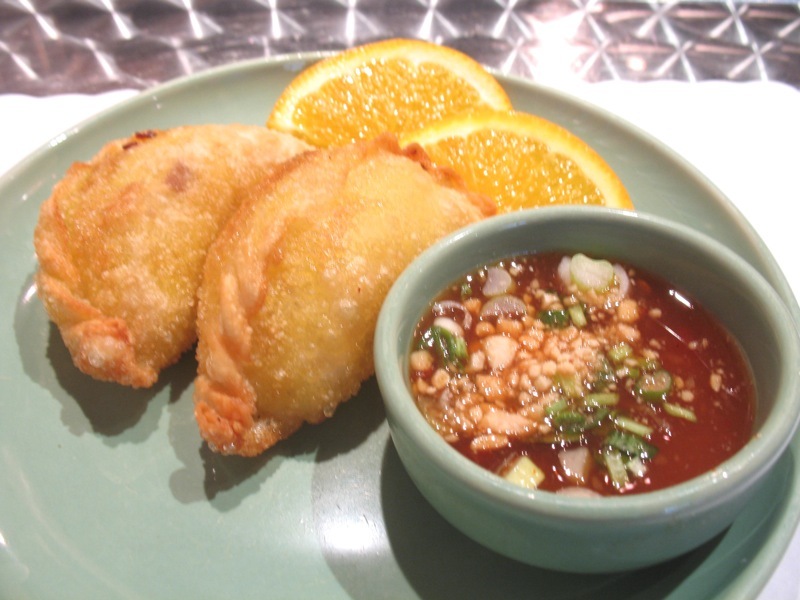 Curry puffs with a sweet chili dipping sauce. These reminded me of samosas with their savory curry filling, but the dipping sauce added a tantalizing twist to the experience. We also had a summer roll, which combined the flavors of noodles, tofu, cilantro, and bean sprouts in a cooling rice paper package. The dipping sauce for the summer roll was simple but divine. In fact, it tasted so complex and layered, that I started freaking out that it might have fish sauce in it. Our server assured us that it had no fish sauce, and was totally vegetarian, so now I am on the quest to re-create the perfect summer roll dipping sauce at home. In an unusual move, especially after having 2 appetizers, Daiku and I both ordered full entrees. And are we glad we did! 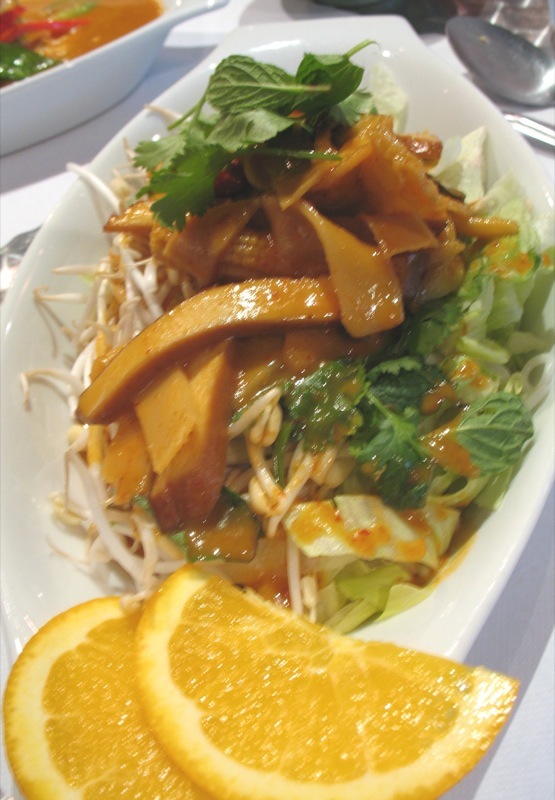 I had the kha noom jeen (veggie), which was noodles topped with two kinds of tofu, sprouts, vegetables, mint and cilantro with a panang curry sauce served on a bed of lettus. Flavorful, crunchy, summer perfection. 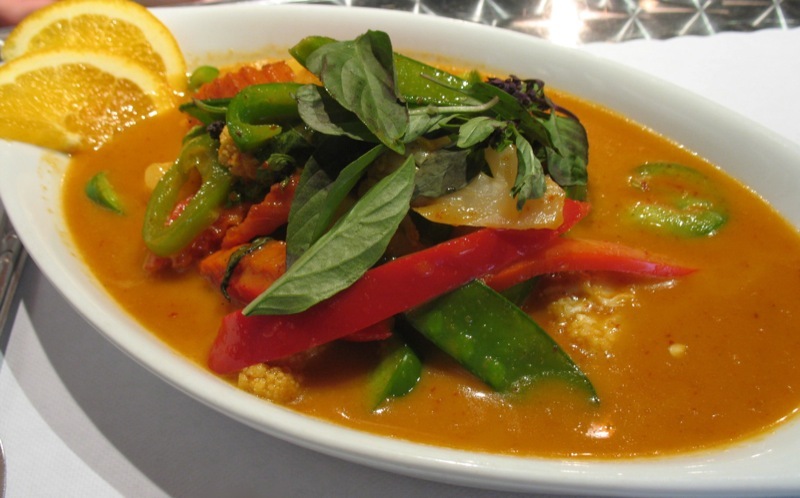 Daiku went for the panang curry with pineapple, which he asked to be made extra spicy. This was served with a side of rice, and was incredibly colorful and flavorful. The pineapple was the best foil for the heady curry and the spicy peppers, and of course the fresh basil brought everything to a new level. Surely we thought, upon ordering 2 entrees, that we would have some leftovers to take home? Wrong again- before we knew it, we had slurped up all of our food. We must have been in some sort of food-induced coma, because when our server asked us if we wanted the dessert special, we... said yes! 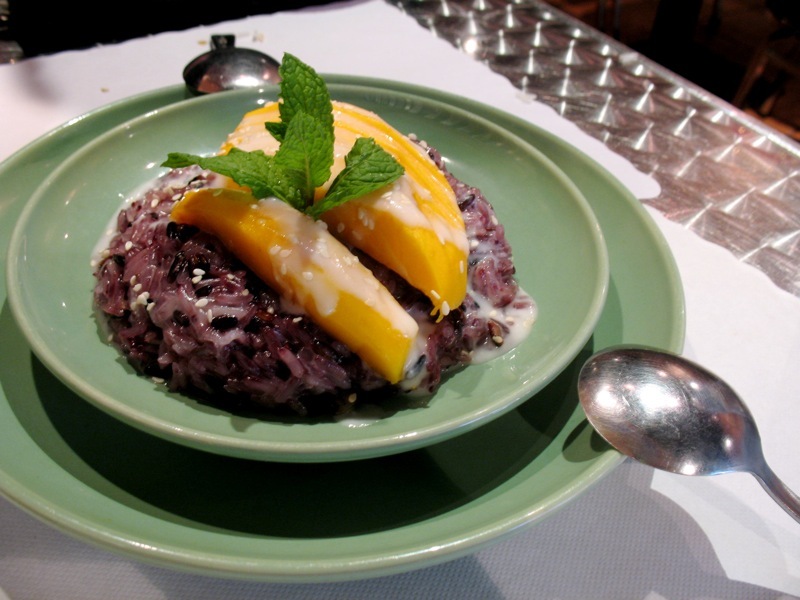 Dessert was a simple rendition of this popular dish: sticky rice (we were asked to choose between white and purple, and went for purple), perfectly ripe mango, sweetened coconut milk, and sesame seeds, all served warm. Once again, Daiku and I thought, there is no way we could get through this starchy, carby dessert after everything we've eaten. Once again, we were wrong. We finished up every last bite of the dessert (somewhere in the back of the restaurant, the staff was either horrified or highly amused by our gluttony). All this, plus tip, cost less than $28. The restaurant provided us with free bottled water, which they refilled without our having to ask for it. They were also very good about offering us extra rice, which most other restaurants in our experience do not do. 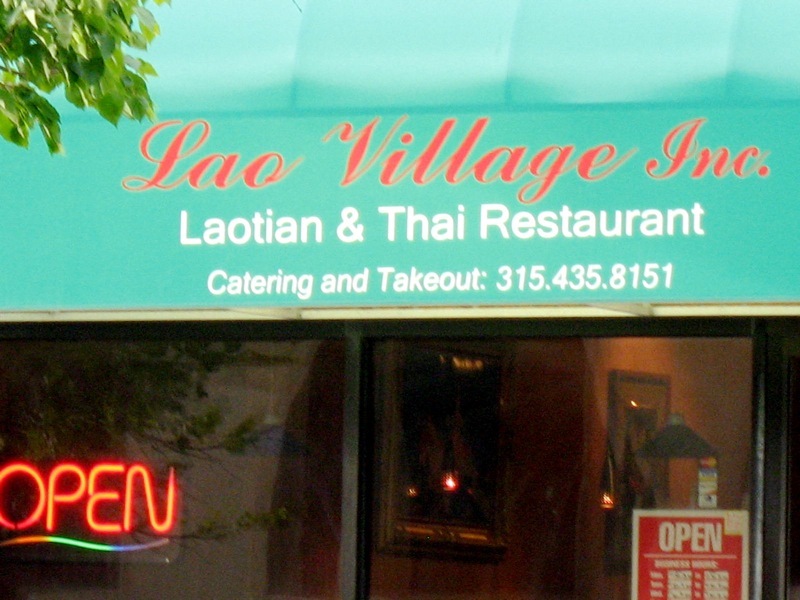 Over all, Lao Village is a friendly place with a real neighborhood vibe, which is a plus in downtown Syracuse. 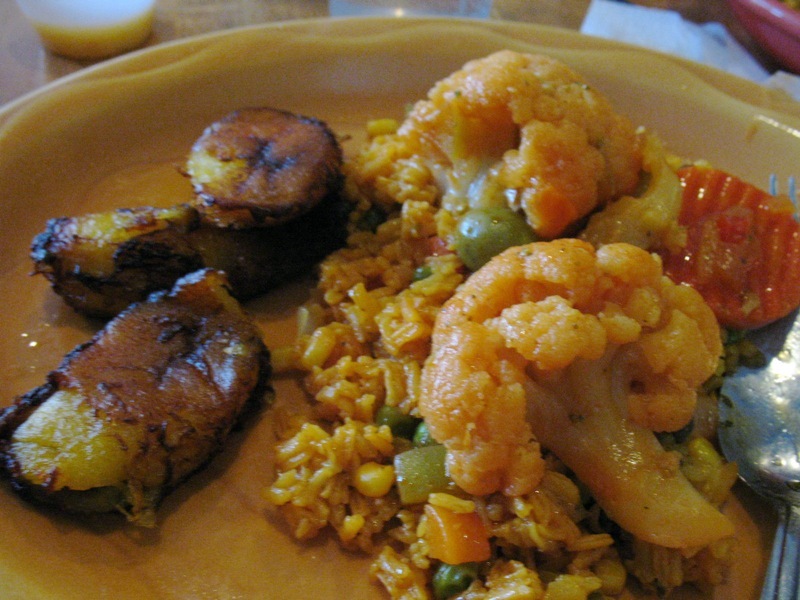 And the masterfully prepared food fit the bill on a tropical almost-summer day. 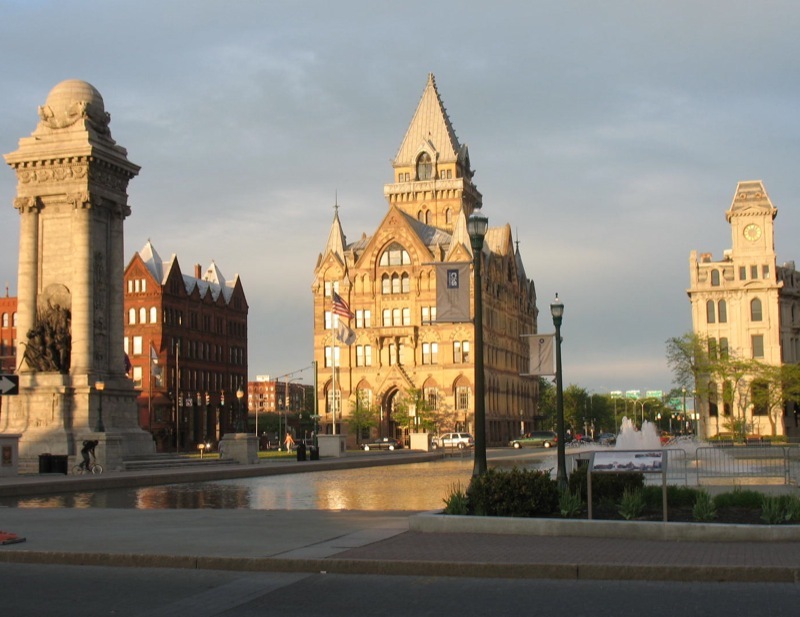 After you eat here, and especially as you are likelly to over-indulge like we did, you can walk around Clinton Square in downtown Syracuse, which, having shaken off the snow and gloom of winter, is looking downright lovely right about now. I have been tagged for two memes- and you guys know how much I love these things, so here we go. 1. I wish that my friends and I greeted each other in the continental fashion: kisses on the cheek. Instead, most of us are huggers, and it's really difficult and awkward to try to kiss someone who's going in for a hug, so... I'm a hug-greeter. I have a few friends who always greet me with kisses, and most of my family are kiss-greeters, so I'm happy about that. But anyone reading this: feel free to go continental on me! 2. I am very voyeuristic, especially about very conservative things. When I lived in California, I used to love listening to Dr. Laura, even though I find her repulsive and disagree with 100% of what she says. I love reading the blogs of the ultra fringe: women who believe it is God's commandment to "submit" to their husbands, who believe God has commanded them to have tons and tons of babies (we're talking double digits), who believe it is a sin to send girls to college, or for women to wear pants, who believe evolution is a hoax, etc. I really don't understand the attraction, especially since these things often leave me perplexed, outraged, or depressed, but then I go back for more. 3. On a semi-related note, I am an atheist. For a long time, I referred to myself as an agnostic, because I believed it was a more tenable stance, less controversial, or more philosophically elegant. But the older I get, the more I realize that "I am so made that I can not believe" (quote by Blaise Pascal)- I am straight up atheist. Perhaps #2 (above) has helped to cement my belief. Ironically, though, becoming comfortable with the atheist label has coincided with my growing quest to seek peace, compassion, and spirituality in my life. Go figure! 4. If I had not gone into the humanities, I would have majored in political science and international studies. In the second semester of my senior year of college (i.e. very very late in the game), I took an awesome upper division course called "the politics of immigration." It opened my eyes, taught me to question long-held beliefs, and fascinated me. I did very well. And I got a glimpse into what could have been if only... On a related note, my fantasy job has always been to work for Amnesty International in some capacity. 5. I love roller coasters. I want to visit the tallest, fastest, most extreme roller coasters in the country! Similarly, I have always wanted to sky-dive and bungee jump. I love the sensation of falling. Even as a very very young child, I had a frequently recurring dream that I was floating down from the fourth floor of our apartment where we used to live, all the way down to the basement. The dreams are always very vertiginous- I don't want to fall, but then I do, and I enjoy it and am creeped out at the same time. 6. And yet, I'm also a bit of a coward. Daiku's dream is to fly planes and do similar things, but I hold him back because I'm convinced he'll die. I have a huge phobia of ferries, and being on a sinking ferry in the middle of open water. 7. Even though I am trained in art history, I often find it difficult to focus in museums and take "high art" seriously. It's much nicer to approach museums with a spirit of fun and whimsy. I have a photo group on Flickr called "Fun With Modern Art" devoted to this very concept. If you like to have fun with art, think museums are more like playgrounds than hallowed sacred spaces, and think the old masters are kind of hilarious, then please join the group and submit photos! Ok, I'm going to tag 7 people to tell us 7 random things about themselves, I apologize if you've already been tagged! Urban Vegan, Trac, Bridget, Candi, Textual Bulldog, Mihl, and Celine, care to share?? I would love to know more about you! For the second meme, Samantha of Get Green Things has tagged me to name 5 blogs that I visit, that are smart and teach me things. As you can see by my wild and wacky list of blogs to the right, I visit a whole bunch of blogs on an almost-daily basis! You all teach me things regularly. It was nearly impossible to narrow this list down, so I decided to go with blogs that some of you may not have seen yet. If I mention your blog, you have been tagged to make a list of your own 5 blogs (or however many)! Conscious Kitchen - Emilie is a master of the cupcake arts, and also of infusing her writing with thought-provoking ideas. You come away from reading each of her posts with a hungry belly and a desire to make the world a better place. You and me and the devil make three. 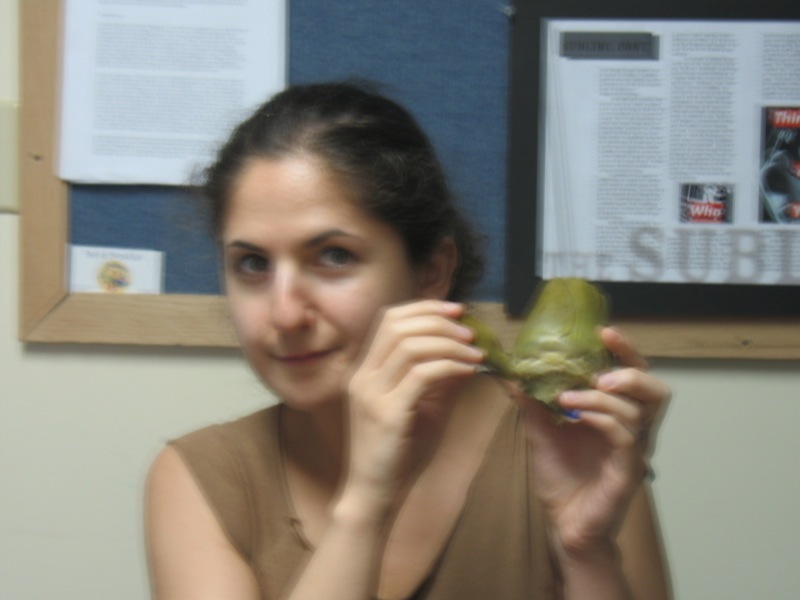 The personal blog of my old friend Liza. She and I have known each other since high school, and she was the same lovely, passionate, creative and talented girl then that she is now. I say this despite the fact that she knows many horrifying secrets about me (mispronunciations of my name, questionable stationary choices, crushes on old French dudes...) Visit her blog to see some of her beautiful and unique illustrations. 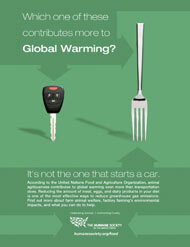 Better Politics Through Food. From her description: a graduate student, a Quaker, a lesbian, a Brooklynite. Some of the most consistently eloquent musings about food and the multiple intersections it makes with our personal, cultural, political, financial, and familial lives. 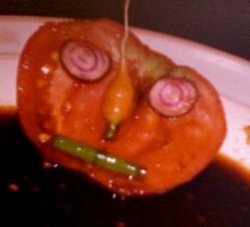 Neva Vegan. Again, this is a woman who delves deeply into the issues. I always come away from this blog awed by her deep compassion, wondering about my personal choices and beliefs, and convinced that I need to learn more! Nutrition Ambition. 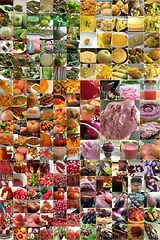 Roxy comes up with some of the most colorful, refreshing recipes I've ever come across. 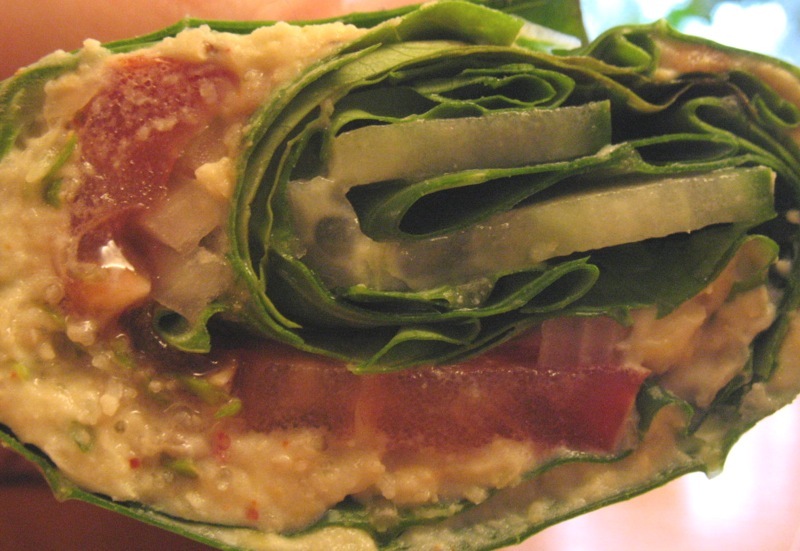 Whether ultra-healthy or super-decadent, you won't be able to get her foods out of your mind! Thanks for participating, everybody! I realize I've just tagged 12 people... please forgive me! I got cut up pretty badly. I realized that my doctor had admonished me to get a tetanus shot over 2 years ago, and I hadn't gotten around to it yet. So we went to the hospital to get my cuts cleaned up and to get a tetanus shot. A few hours later, I came home looking like a burn victim, as you can see above. I could barely move my hands, and my wrists, elbows, and legs were in loads of pain too. And all I wanted to do was blog about artichokes! So enough about injuries and hospitals and trauma. On to artichokes! These beautiful vegetables are one of the many signs of Spring's arrival that I have gotten to enjoy in the last week or two. 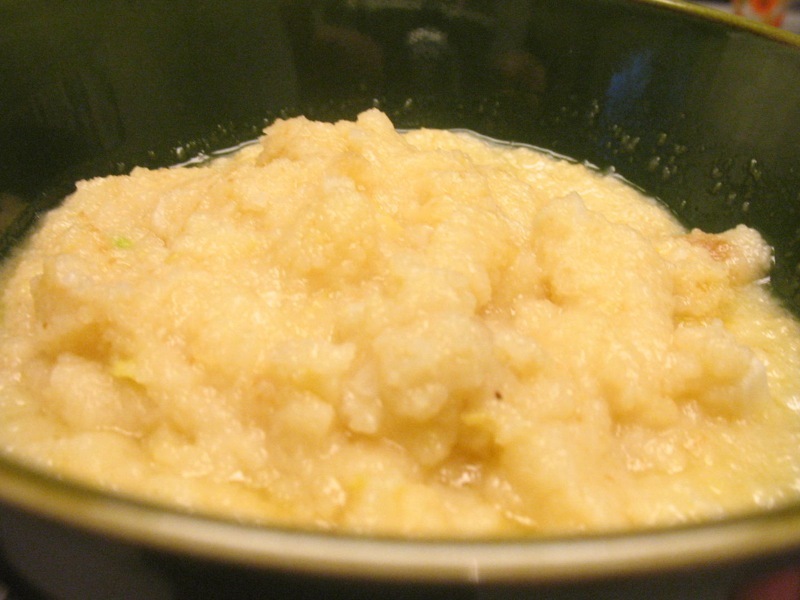 Daiku and I decided to simply steam them in water with a bit of lemon juice. Now artichokes taste just wonderful on their own, but it is fun to dip the leaves into something delicious every once in a while. Most dips, like melted butter, however, are too runny for me. I like something to really cling on to the leaves. Add 1/4 - 1/2 cup of very fine breadcrumbs, stir until heated through. Add the juice of 1/2 a lemon and up to a teaspoon of lemon zest. 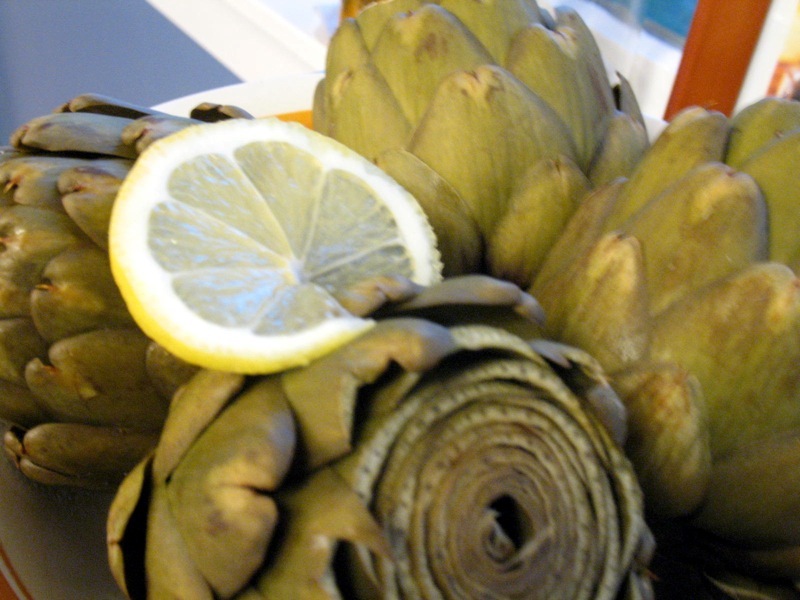 Serve warm with artichokes. 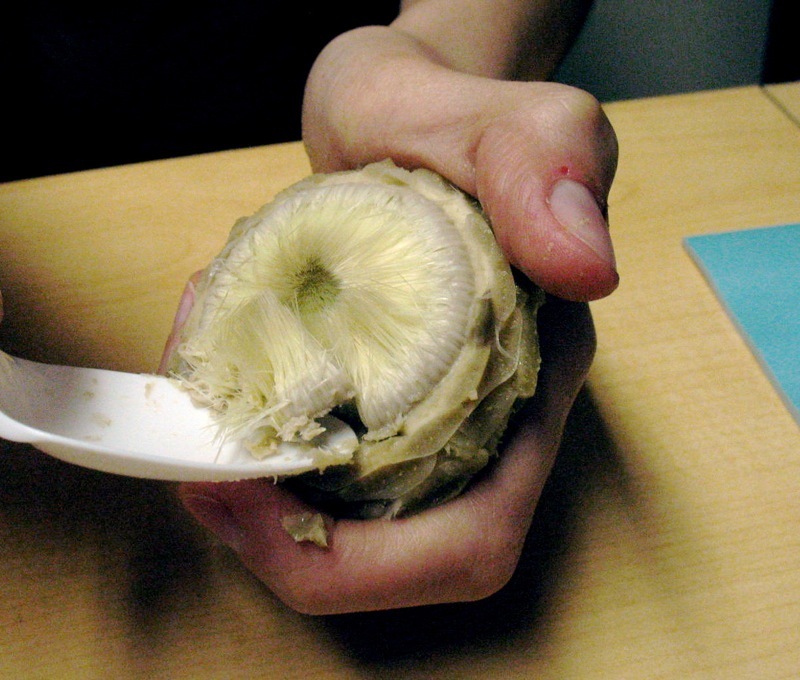 Don't forget to remove the thistles when you are done with the leaves- they expose the succulent artichoke heart! 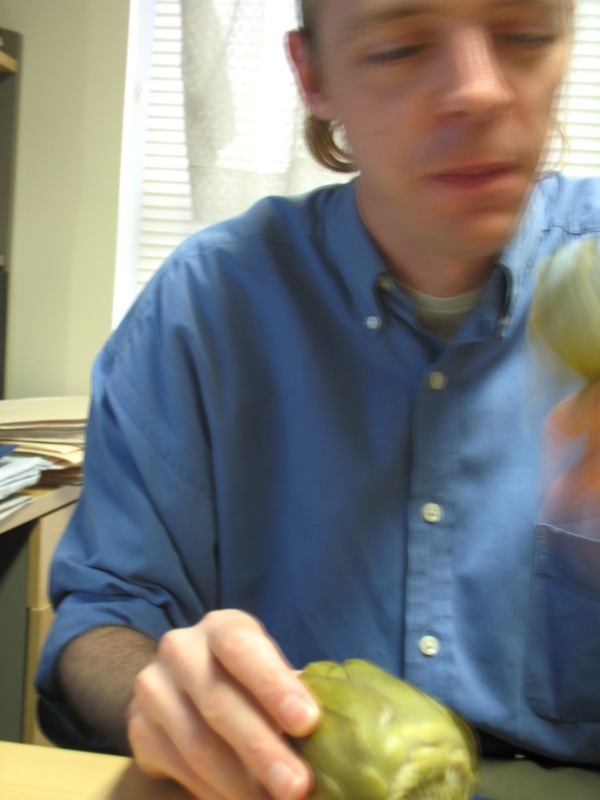 Here's Daiku enjoying his artichoke. 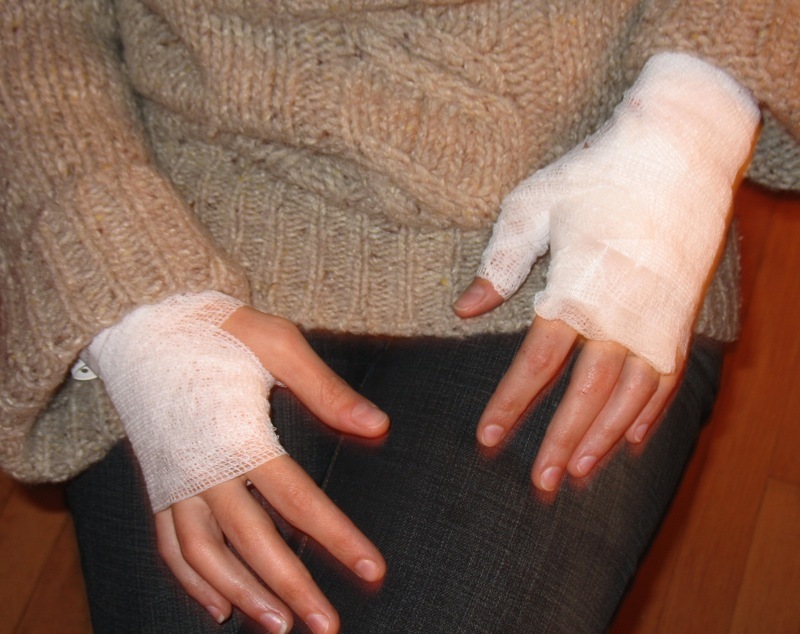 And here's me, pre-injured hands. Later that day, we bought my new bike. So that's my story. Eat artichokes. Stay up-to-date with your tetanus shots. 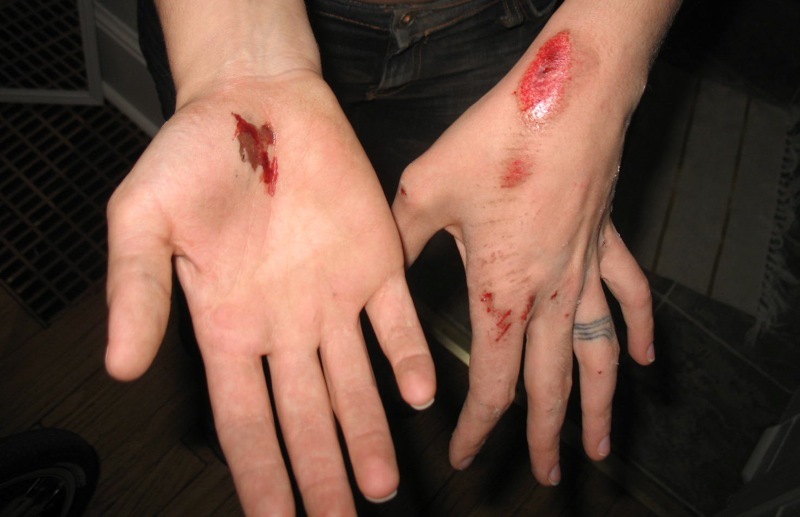 Be careful on your bikes. And, as cheesy as this sounds, don't take anything or anyone for granted, because life comes at you fast. Ah yes, the fennel. Finochio. Anise. Whatever name it goes by, it is my bulbous friend. If you doubt my love of this wonderful and aromatic vegetable, check out this previous post. Or this. Or this. Or... this. 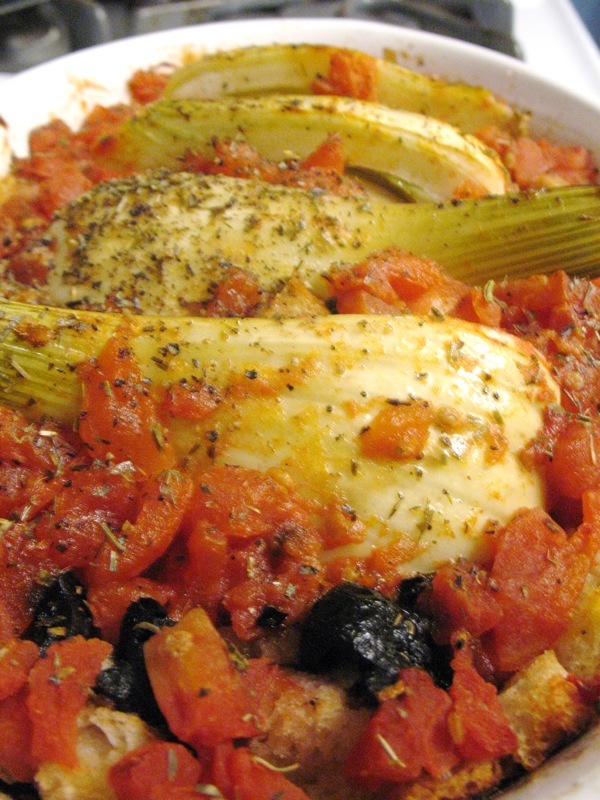 Lucky for me, my super chef of a husband shares my obsession, and one night recently came up with this Italian style baked fennel recipe. The flavors are refreshing like a salad, but the bread adds depth and heft to the recipe, making for a perfect light meal in and of itself. Bake it up. Pour a glass of red wine. Light a candle. And let this seasonal treat work its magic on you. Click here for an analysis of fennel's nutrition. 1 cup of raw fennel has a mere 27 calories, but an abundance of vitamin A, folate, calcium, phosphorous, and other goodies. Well, not really forever. Today was graduation day at Daiku's school- this means the end of lesson plans, teaching, advising, and grading for the year. Now, we can turn our attention to the summer and all the promise it holds. And, now I can come back to blogging regularly. 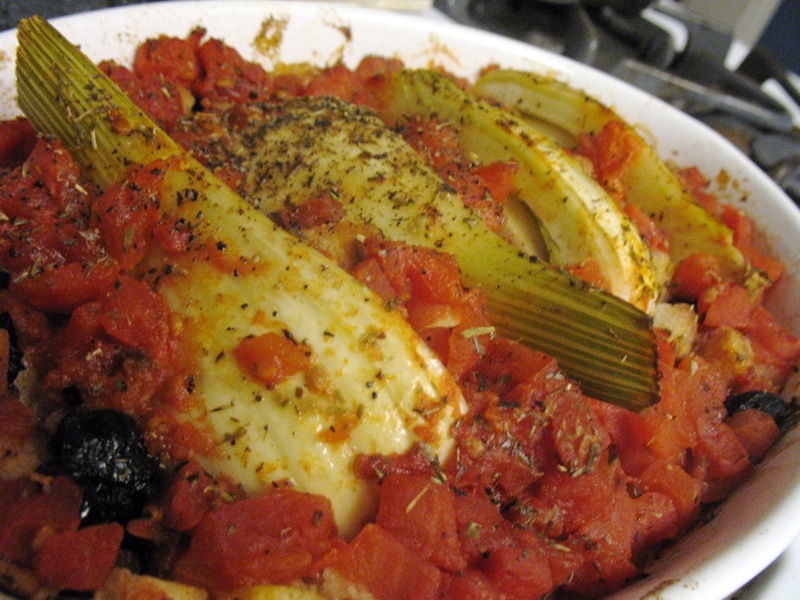 Here are two fabulous warm-weather meals that we have had recently. I love this time of year, when the produce comes in, the farmer's markets start up, and thoughts turn to barbeques, picnics, the beach, you name it. 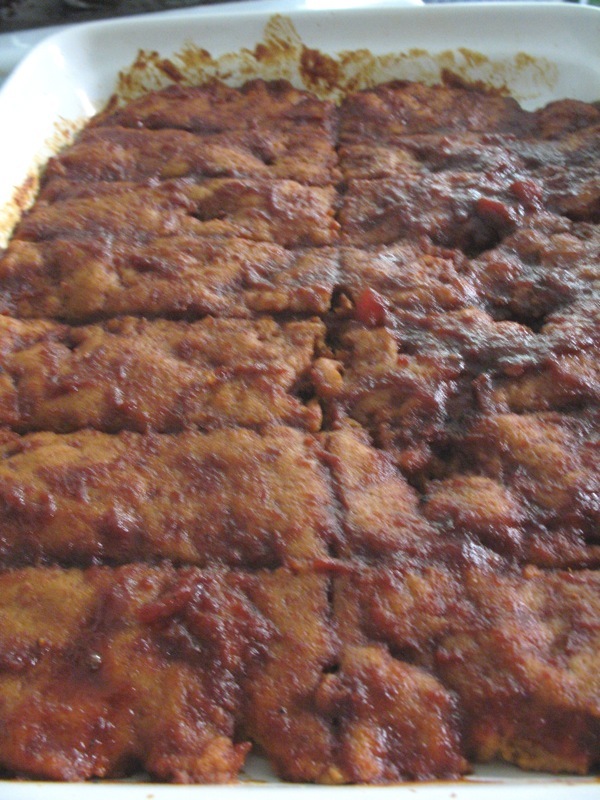 seitan ribz coming out of the oven, covered in home-made BBQ sauce and ready for the grill! First, some Barbequed Seitan Ribz from Fatfree Vegan. As soon as I saw this recipe, I knew we had to try it- and am I glad that we did! Words can not express how fabulous these are- please make some right now! We grilled them on the stove-top grill, since the little hibachi hasn't come out from hibernation yet. The BBQ sauce was home-made because there were no BBQ sauces available that didn't have high-fructose corn syrup as their first or second ingredient- yuck! 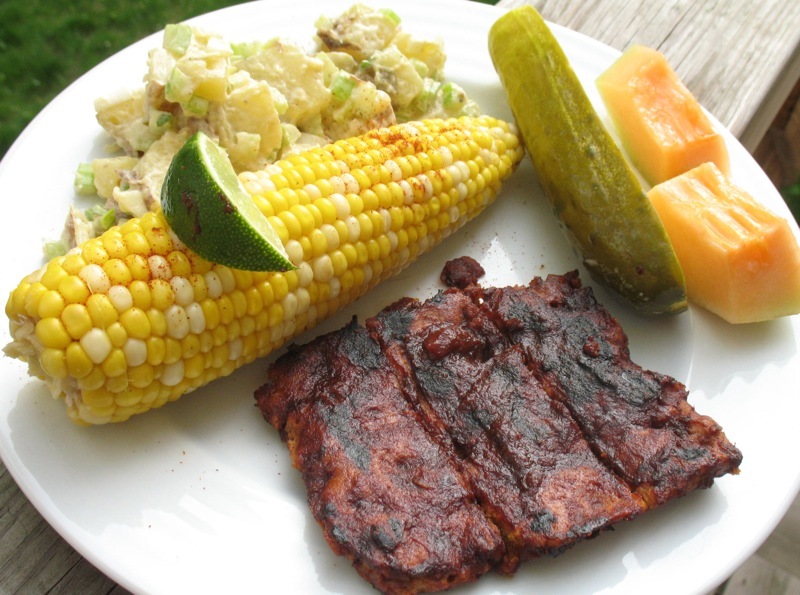 The ribz were served with fresh corn topped with lime juice and chili pepper, some home-made potato salad, some cantaloupe, and a dill pickle. Vegan ribs, y'all! Why aren't you making these yet? Go, go! The second summery meal was a hummus spread. I had made a huge batch of garbanzo beans, and Daiku used some of them to make a spicy hummus. 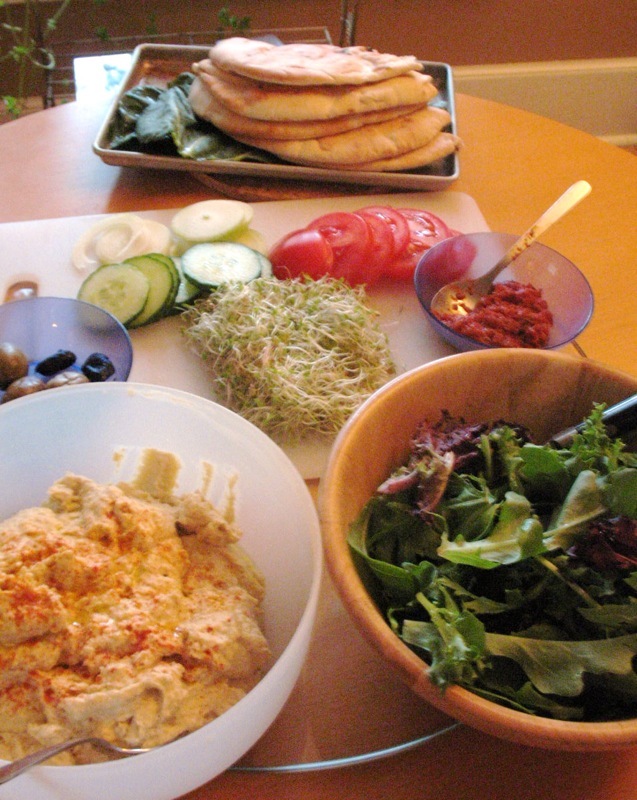 To serve them, we had a mixed green salad, some olives, some harissa, sprouts, cut-up tomatoes, cucumbers, and onions, white and whole-wheat pitas, and... collard green leaves! Raw collard greens are tender and tasty. Can someone tell me why the traditional American method of cooking them has been to boil the bejeeesus out of them for hours in pork water until they're limp and gray?? Ok, I'm off to catch up on all your fabulous blogs, and I promise to post every day for the next week! This meal took 2 years to make! ...well, not really. But a part of it took almost two years to grow. Let me explain. Picture it. Irvine. Summer of 2005. I was packing up and getting ready to move to Syracuse, where Daiku was teaching. His birthday was coming up, so I decided to send him a gift that would symbolize our lives and relationship at that time. I was leaving California, and one of the things we would both miss about it was the fresh produce, especially the citrus fruit that grew everywhere. So I chose to send him a miniature lemon tree from Harry & David, like this one. I figured the tree would be a fun thing, and a way of having a piece of California sunshine in upstate New York. The catalog promised us that out tree would grow loads of lemons, so flavorful and delicate that you could eat them skin and all. It all sounded fun and intriguing. The gift arrived to Daiku. Really excited, I asked him over the phone, "do you see any lemons yet??" He replied, "No... it's a little... puny." It turned out that the lemon tree they had sent was far from the lush fruitful tree we had been promised. I was a little disappointed, but Daiku decided to get on the phone to Harry & David and see if they could help. They were really helpful on the phone, and promised to send another lemon tree to replace the first one. 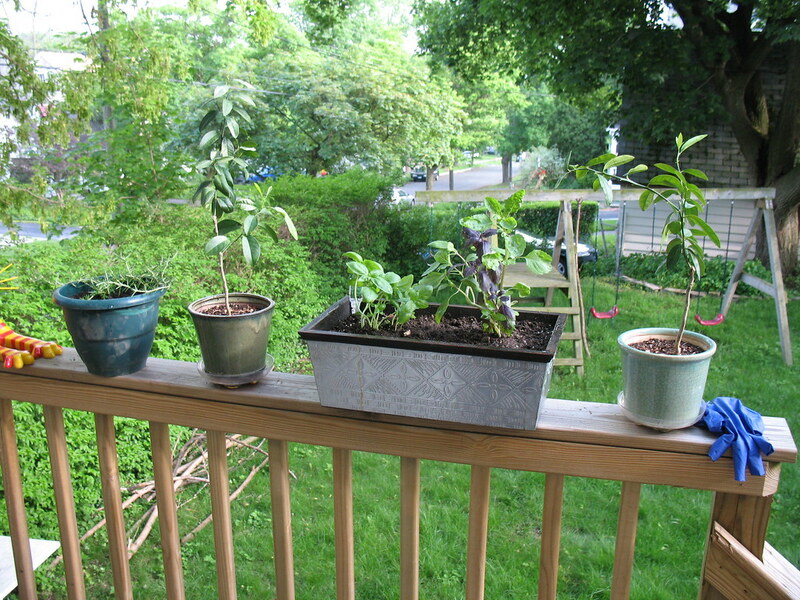 And that is how we ended up with two tiny trees, supposedly about to sprout lemons any day now. So we put them in the sunshine, watered them, and waited. The little trees became a part of our lives. We forgot about the lemons and treated them as beloved house plants. 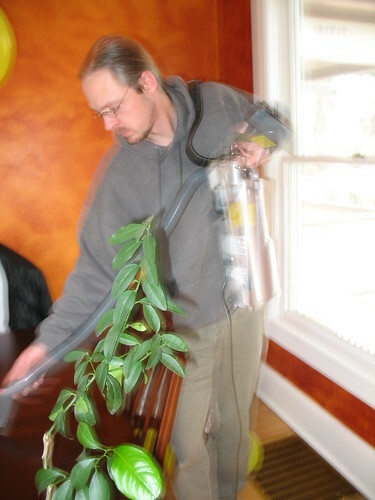 Above, you can see Daiku vacuuming around one. 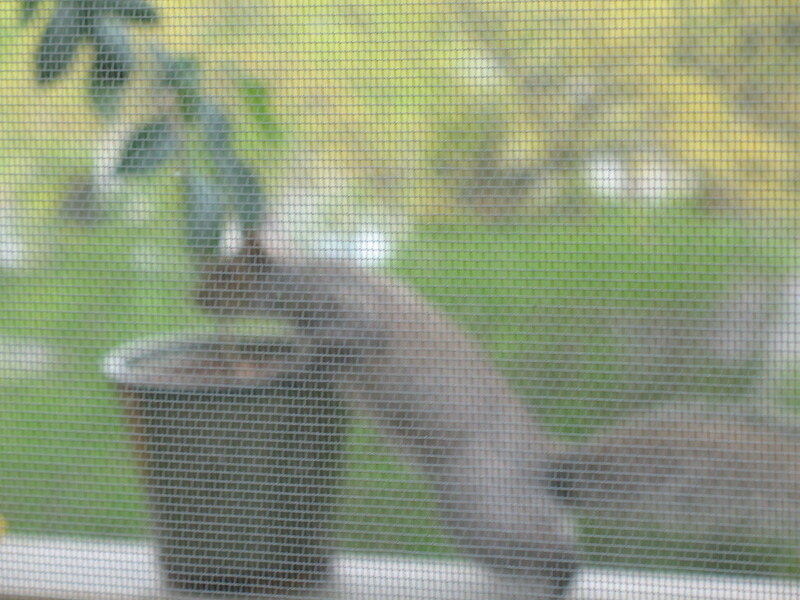 Here's a squirrel, investigating a lemon tree out on the porch. In the summer, we moved the trees (which we'd named Ramon and Ramona by this time) to the yard, so they could enjoy extra sunshine and warmth. They proceeded to get infested with aphids. 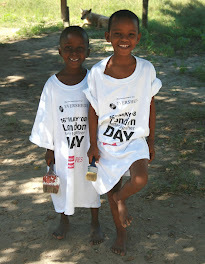 We lovingly treated them with neem oil, since our garden is organic and we couldn't use pesticides or other chemicals. And then, a breakthrough! Little white flowers bloomed on the plants- could lemons be far behind? In time, we saw tiny little buds, lemon fetuses, if you will and got our hopes up that a huge lemon crop was due at any time. However, soon the weather turned cool and we had to move the plants inside. Most of the little fetuses disappeared, but one little lemon hung on. We let it be. Weeks went by, then months. 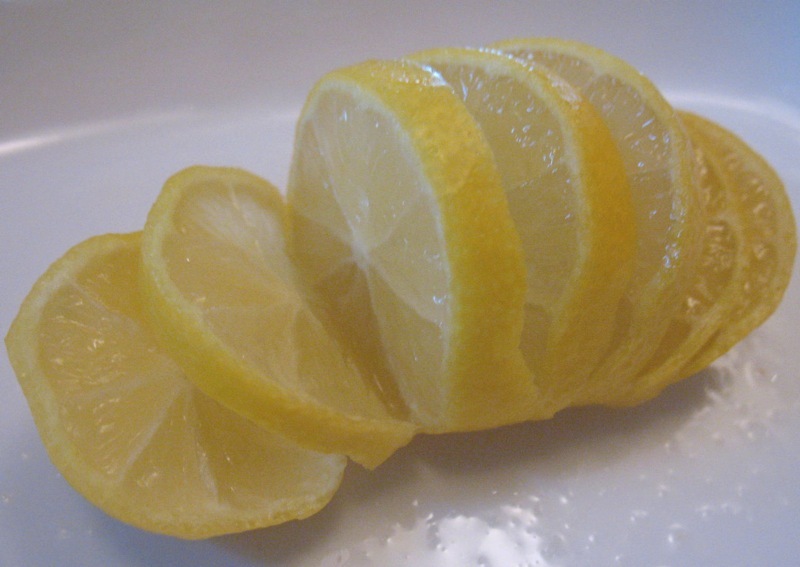 Then one day, a perfect little lemon was born. It was time. Time to eat our baby. 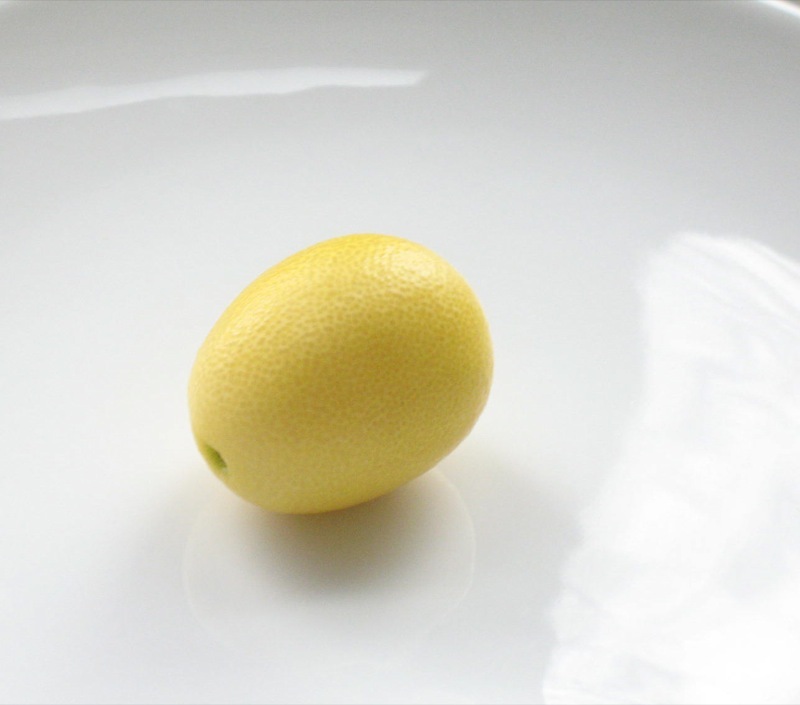 We spent a few days contemplating the perfect way to eat the little guy, the lemon that had taken nearly 2 years to grow. 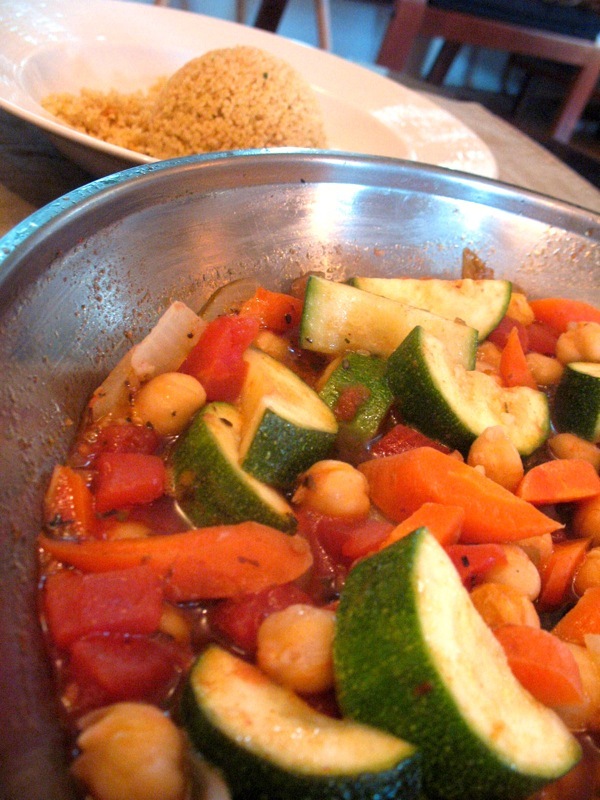 We decided on a Moroccan-style vegetable tagine with whole wheat couscous, figuring that the fresh acidity of lemon would be the perfect note to bring out the full flavor of the chickpeas and the summer vegetables such as zucchini and tomato. And there it was- the meal that took two years to come into existence. 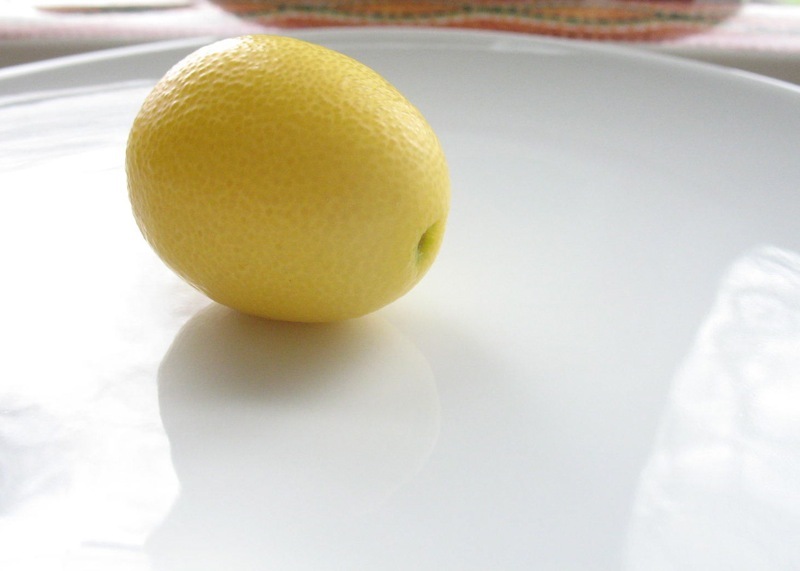 The lemon was perfect, delicate, and juicy. 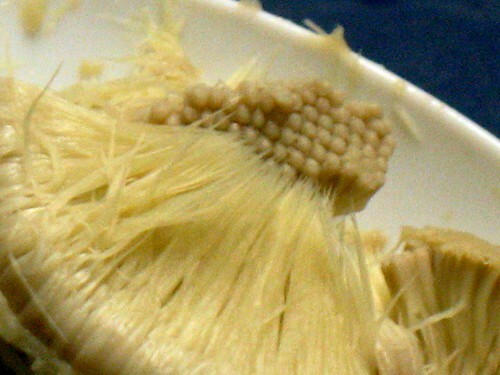 The skin was, indeed edible. 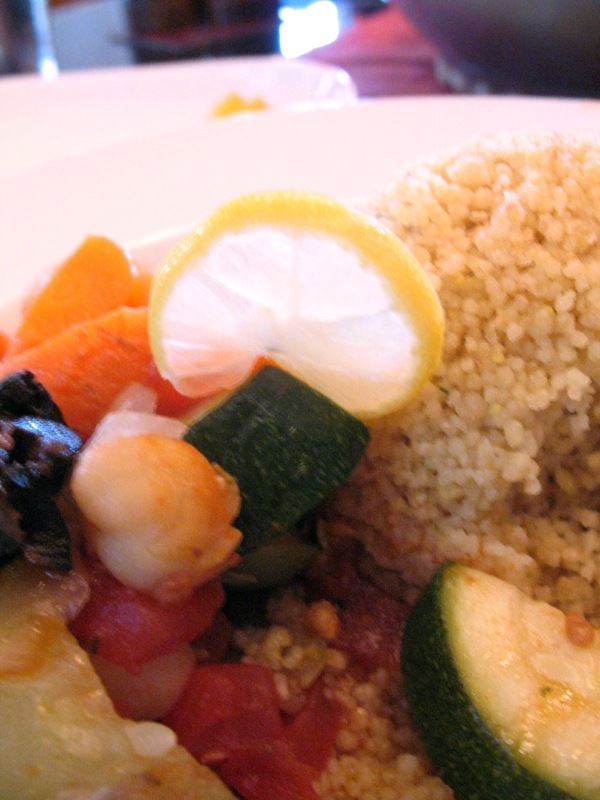 We really enjoyed the couscous. And then it was gone. And now we are left with two lemon plants, and an empty place in our hearts. We are thinking of transfering them to bigger containers this summer, and pruning them, to give them a fighting chance so that maybe, just maybe, we can enjoy another meal like this some time in 2009. So last week this house reached the peak of end-of-school frenzy. The cupboards were bare, the few remaining produce items were going limp in the fridge, there was no time to go food shopping, and the Chinese menus were becoming more and more attractive. One night we ordered some Hunan style tofu, which turned out to be spicy and good. The tofu, accompanied by tons of veggies and black bean paste, was crunchy on the outside and creamy on the inside, just perfect. And the portions were so big! The next day, I had a ton of leftovers. How to eat them? Behold the Hunan tofu pasta salad: chunks of tofu, brown rice pasta (hey, it's made of rice, so it's kind of like rice, right? right? 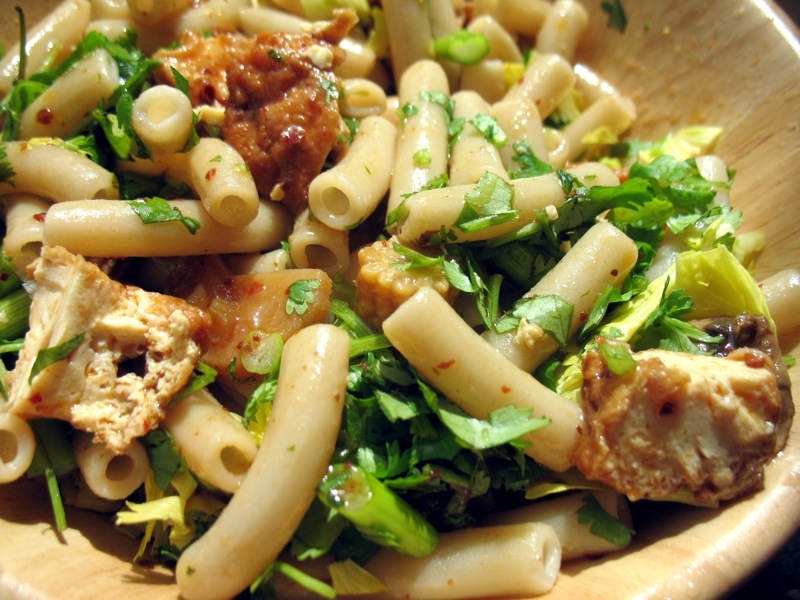 ), celery and celery leaves, and cilantro tossed with the sauce from the tofu plus some apple cider vinegar. It was surprisingly good and refreshing! 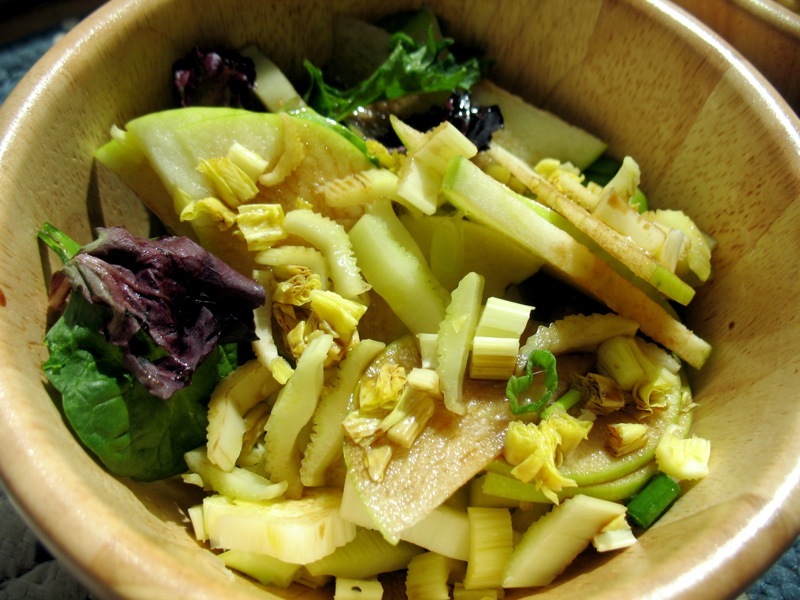 To accompany it, a salad made with the last handful of mesclun greens, some apples, and some celery, this one tossed with a smidge of balsamic vinegar and garnished with a few slivers of scallion. Not a bad lunch. It provided a peaceful respite from the chaos of the last couple of weeks. To all of you college students or teachers, or for anyone living with one, I hope the stress of finals is done, or close to being done, and that everyone survived intact and well-fed! 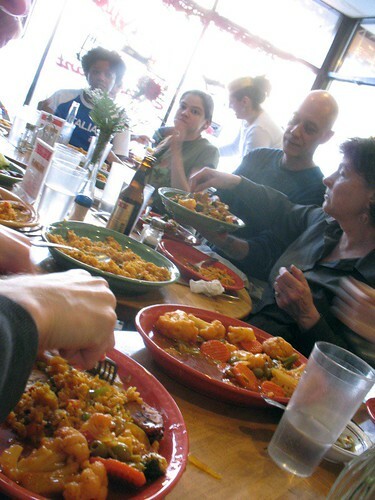 Monday was our second** Syracuse Vegan Society (SVS) dinner, this time held at Las Delicias restaurant. We had such a great time! But first, I take you behind the bash, to see some of the preparations that went into this event. On Sunday, I met up with Bridget and Trac at Trac's house for some pre-dinner cupcake baking. Because Las Delicias is a Caribbean restaurant, we thought that the Dulce sin Leche cupcakes (from "Vegan Cupcakes Take Over the World") would be a most appropriate choice. But first, we needed sustenance to get us through all that exhausting baking! 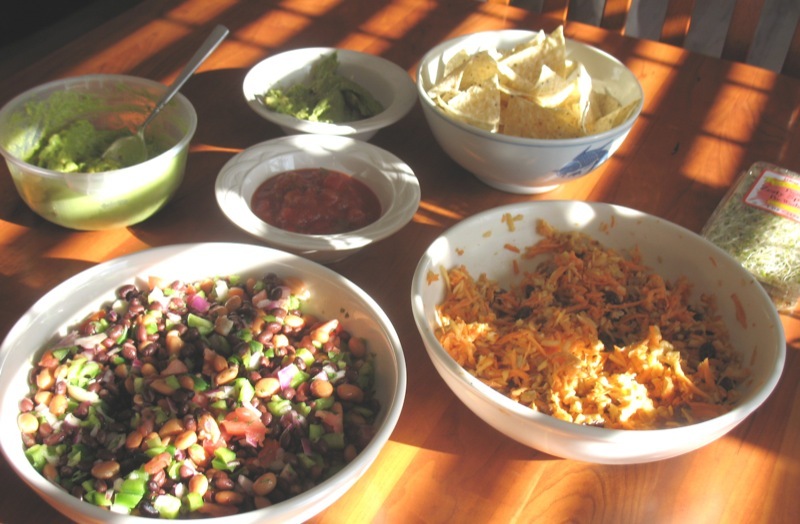 Bridget made us this amazing feast that you can see above: bean salad, raw salad (carrots, yams, apples, walnuts and raisins), guacamole, salsa, tortilla chips, and avocado spread. But wait, there was more! The pièce de resistance were these gorgeous sandwiches (a Sarah Kramer recipe). The slices of bread were covered by an Earth Balance/soy parmesan spread, then grilled. 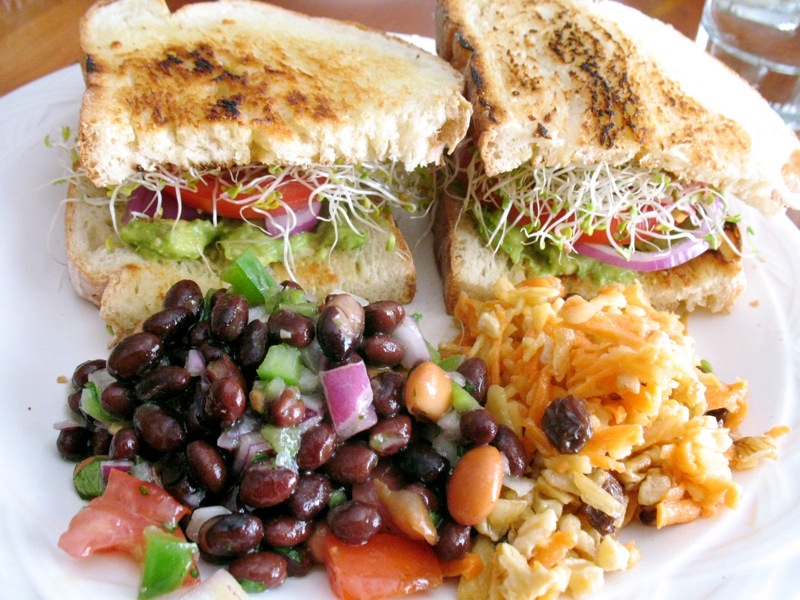 Into these babies went: avocado spread, tomato and red onion slices, and sprouts. So simple, yet so delicious. After that energizing meal, the baking could commence. 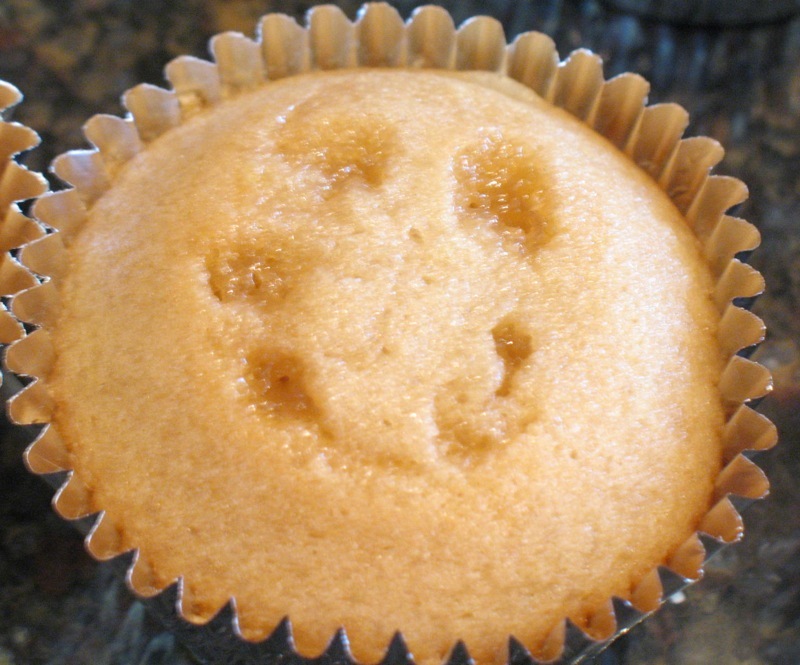 Here are the dulce sin leche cupcakes coming out of the oven, the caramel drizzle resembling a happy face. 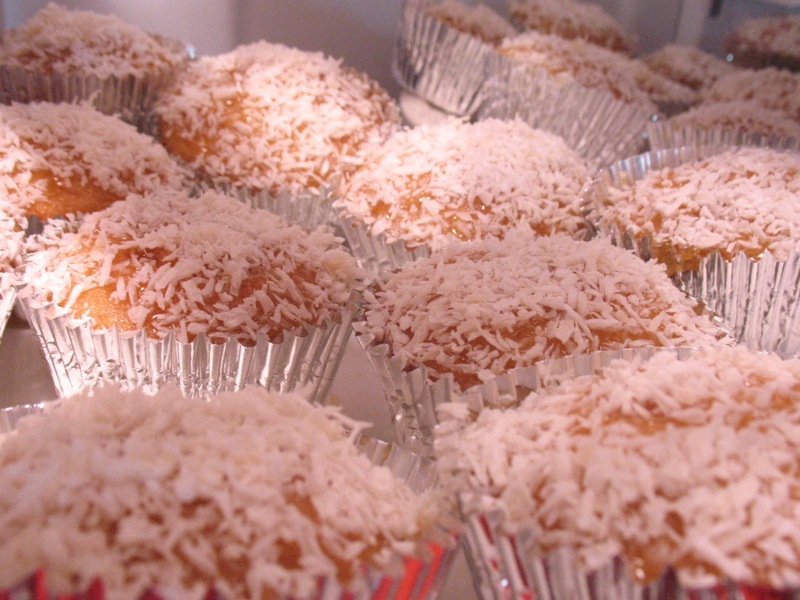 And here they are cooled, covered in more caramel, and topped with coconut. We tasted these cupcakes the next day, and they were excellent: moist and rich. 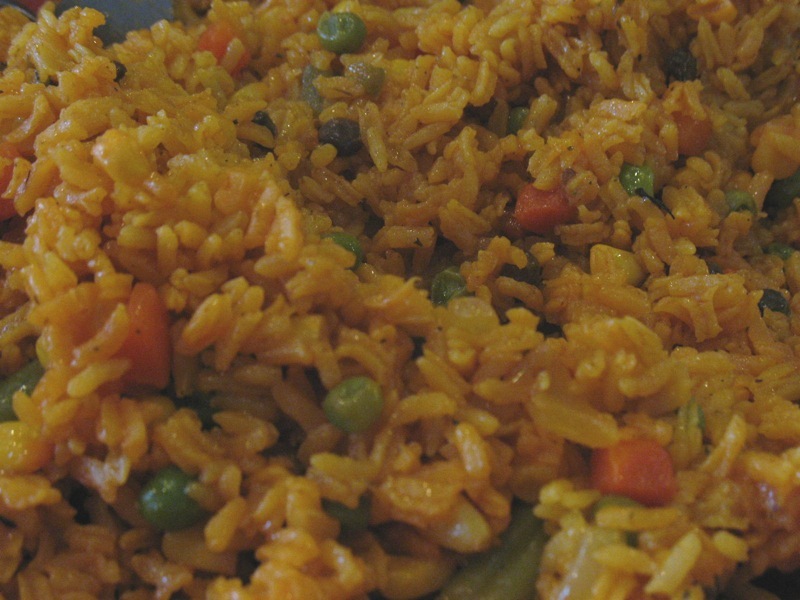 Two different kinds of rice: one with mixed vegetables (above) and one with pigeon peas. 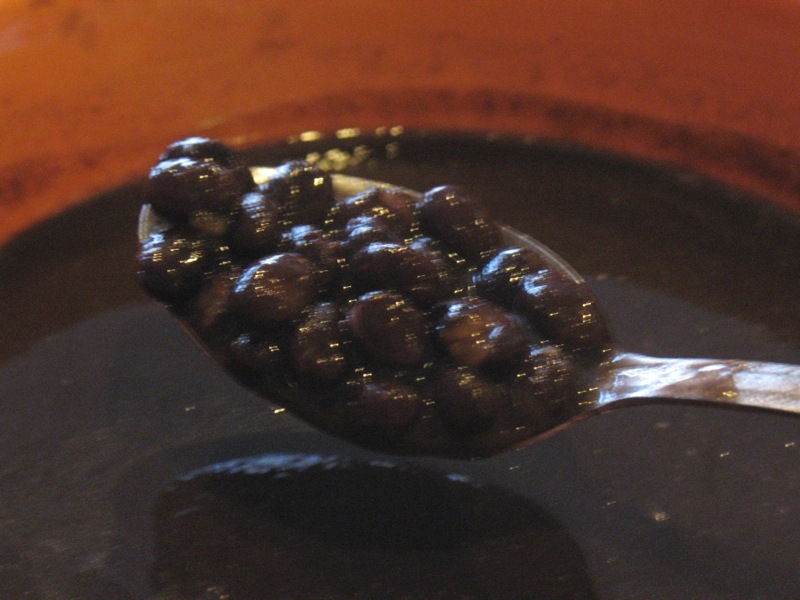 Last but not least, some excellent spicy black beans. There was more, including salads, empanadas, and a fabulous garlic sauce that I didn't get photos of. 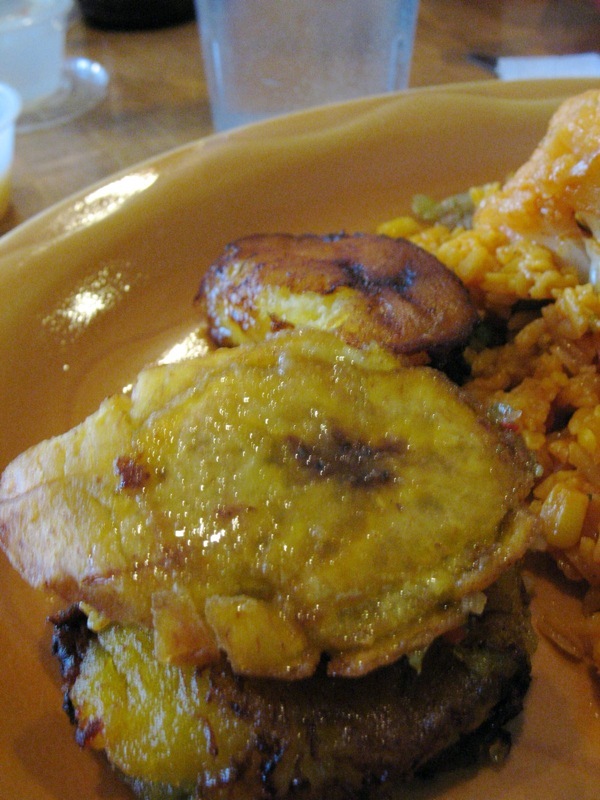 You can see some more shots of food from Las Delicias (including the empanadas!) in this previous post. I want to give a shout-out to Trac and Bridget for their time and energy organizing and running these dinners. They are so fun, such a great opportunity to meet new people, and oh yeah, deeeee-licious! Not to mention, this is a great way to raise money and awareness for animal rights, and to let local chefs know that there is a market for vegan foods. T-Bo, staring curiously. 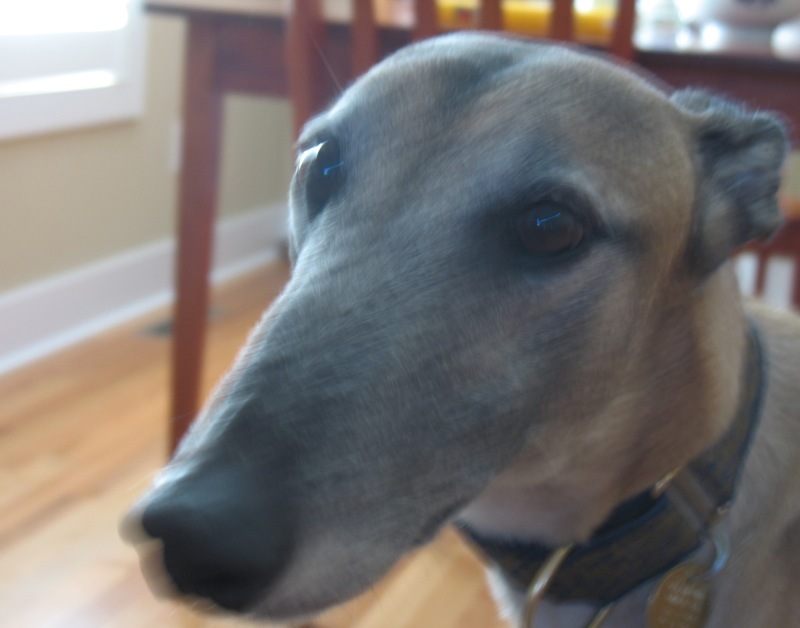 He is a foster with a troubled past, but you wouldn't know it to play with this gentle boy. Read more about T-Bo on Trac's blog here. 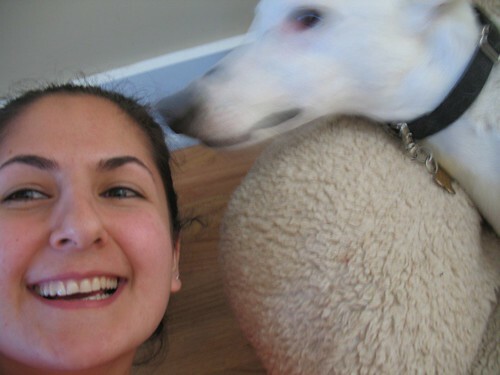 Finally, Cosmo, the runner, seen here sniffing my head. 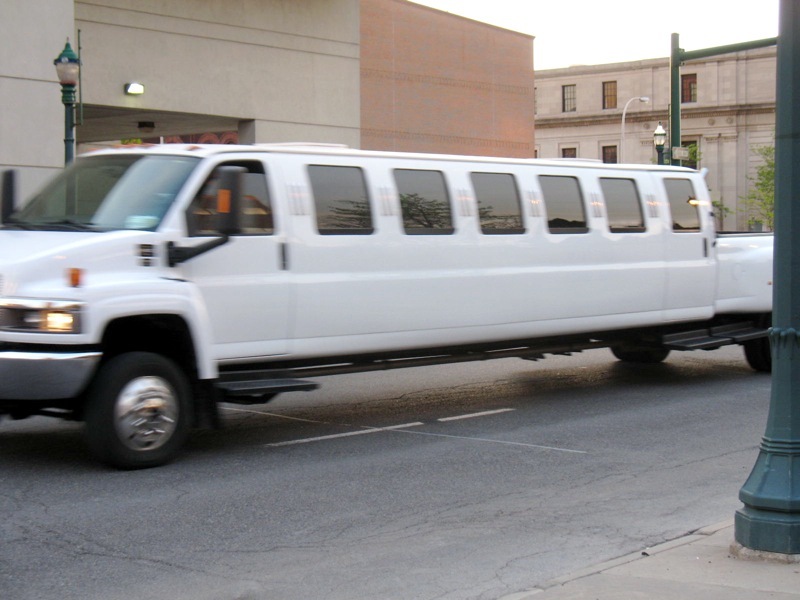 **Read about our first SVS dinner, held at Steve's Cantina y Grill in March, here. Rochester? I hardly even know her!